Thanks to supporters like you, we have saved millions of lives through research into preventing, diagnosing and treating cancer. Every second counts, so it’s critical that we raise as much as possible to continue this progress. We will beat cancer. If we get there a year quicker, we’ll save 159,000 lives. If we get there a day quicker we’ll save 430. If we get there just one hour quicker, we’ll save 18 lives. 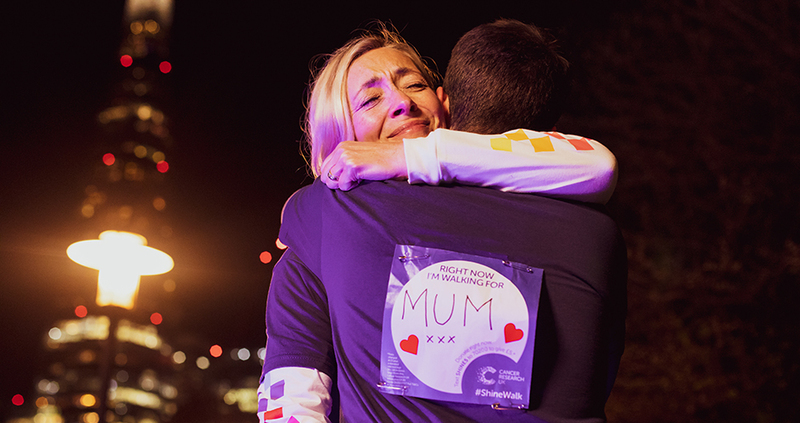 £26or £1 per mile of the full marathon, buys nutrients for cells to grow them in the lab, allowing scientists to find out more than ever before about cancer. £260the amount we ask each of you to raise, covers the cost of a trial for a day to test new combinations of drugs, to improve treatments for more dads, sons, brothers and grandfathers with prostate cancer. £550buys a pH meter to create the ideal environment for sensitive experiments which could hold clues to finding new ways to beat cancer, sooner. £120kwhen we all come together, every £120,000 we raise will cover the cost of a trial for a year to find new ways to treat breast cancer more effectively by testing the benefits of hormone therapy before surgery. You can choose the area of research you would like to raise money for when you enter. It’s the most common cancer in women under 35 and around 970 women in the UK lose their lives to cervical cancer each year, so there’s still more to do if we’re to beat this disease. Around 2,200 men are diagnosed with testicular cancer in the UK every year. But the good news is that more than nine out of ten men with the disease are now cured, partly thanks to a drug called cisplatin, which Cancer Research UK helped to develop. Gather up your unwanted clothes, books and toys to sell them at a car-boot sale. Or arrange a clothes-swap with friends and ask for a donation to take part. Channel your inner Mary Berry and hold a Bake Off or bake sale. Ask for a donation to enter or to vote for a winner. And if baking’s not your thing, get crafty making jewellery or gifts to sell. Organise a quiz night, fundraising dinner or themed day at your office and ask everyone to make a donation to take part. Have some other great fundraising ideas?